Application Fee : Rs. 50/- (Rs. 25/- for SC/ST ) account payee Bank Draft drawn in favour of ‘Finance Offier, Gautam Budh Technical University, Lucknow’ made payable at Lucknow. 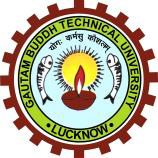 How to Apply : Applications on the prescribed forms duly filled, should reach the office of the Registrar, Gautam Buddh Technical University, IET Campus, Sitapur Road, Lucknow - 226021.